US Director of National Intelligence James Clapper has rejected criticism that US intelligence services missed warning signs of turmoil in Egypt. 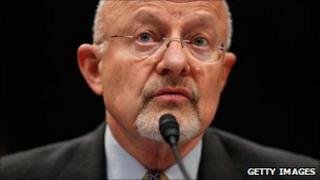 Mr Clapper said intelligence previously pointed out political grievances that threatened Egypt's regime. In testimony to Congress, Mr Clapper also warned of al-Qaeda's shifting threat to US security. He also said the threat of cyber warfare was increasing and its impact was difficult to overstate. The comments came a day after US Homeland Security chief Janet Napolitano said the threat of terrorism in the US was in some aspects at its highest level since 9/11. Testifying on Thursday before the House Permanent Select Committee on Intelligence, Mr Clapper said US intelligence services had done "yeoman's work" on Egypt. They had pointed out political and economic grievances "for decades" that threatened President Hosni Mubarak's rule. He added that popular unrest in the country would have a "long-lasting impact" on North Africa and the Middle East. Mr Clapper said co-operation between intelligence services had helped to avert potentially deadly attacks in the US during the past year, including package bombs sent on two US-bound cargo planes. But he added that al-Qaeda's core in Pakistan "continues to aspire to spectacular attacks", while militant groups in Yemen and Somalia were growing stronger. Elsewhere, US intelligence agencies believe North Korea may have uranium enrichment facilities to advance its nuclear weapons programme, Mr Clapper said, adding that the country might have received outside assistance in creating the plants. Last November, North Korean officials showed US visitors a plant at Yongbyon and said it contained 2,000 centrifuges, confirming American suspicions that the country was attempting to create nuclear weapons. The intelligence chief also warned that China's attempts to advance its territorial claims in the South China Sea might cause potential conflict with its neighbours.